6 Based on the criteria and product performance, which is the best IWB holster for Glock 17? A quality purchase is always reasonable to your budget without compromising the overall quality of the item. The best inside the waistband holster should be just within your price range but must also score well in terms of performance and design. Crossbred SuperTuck Holster. On top of the price scale is this inside the waistband concealed carry holster from Crossbreed. 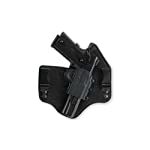 It is a compatible holster for Glock 17 and other versions including 19, 23, 25, and 31 to 35. The higher end in our list, this super tuck holster is made with the finest materials that also last for years. Galco KT224B Holster. Galco Gunleather’s holster with an inside the waistband feature is the selection in our mid-range scale. It is made from long-lasting leather materials with innovative design that makes it a good value for your money. Alien Gear Cloak Tuck Holster. The Cloak Tuck 3.0 holster from Alien Gear Holster is the most affordable in our list, but never the least in terms of quality and performance. 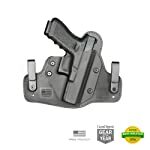 The high quality USA-made holster is also resilient and could last for several years with proper care and maintenance. It basically received an above-average score for quality, making it a remarkable pick for budget-conscious folks. You need to look into the quality of materials for each of the iwb holster in our list because materials determine the durability and resilience of the item. How long the holster could last would mainly depend on how premium quality the materials used for its construction are. Alien Gear Cloak Tuck Holster. The inside the waistband holster from Alien Gear showcases a smorgasbord of top quality materials starting from the thermo-elastic polymer layers that cover the surface of the holster and the patented “Alien Skin” texture keeps the firearm in secure place, adding more grip and no slips. The stainless steel spring band serves as the main source of durability for this item, acting as the backbone of the holster and keeping it functional for years without breakage. Crossbred SuperTuck Holster. Crossbreed’s concealed carry holster is constructed out of black cowhide leather, making it sturdy, formidable, and long-lasting. It is the flagship in the brand’s collection of stylishly designed inside the waistband holsters with premium leather that’s made to last for years. Galco KT224B Holster. The imported holster IWB from Galco Gunleather is one of the most durable items in our list that is resistant from breakage and the signs of wear and tear for years to come. The holster is made from 100% leather materials with Napa leather seam and lining along with the tried and true Kydex Kingtuk hardware. All these construction materials work together to make the holster responsive to all the heavy-duty demands for a concealed carry accessory. A concealed carry accessory should have the size and weight that caters to different users as some would prefer a generously sized holster that is compatible with multiple weapons aside from the Glock 17 pistol. Others prefer a much smaller, lightweight holster to ensure a barely noticeable finish. Alien Gear Cloak Tuck Holster. One of the plus points for this concealed carry accessory is the design that makes it convenient to tuck and hide in your outfit, letting you dress nicely without leaving your firearm behind. You can adjust the ride height and the customizable cant for weapon retention and concealment. Galco KT224B Holster. The product dimensions for this inside the waistband holster is 1x1x1 inches with a 12.8 ounce weight. It is totally concealable with its movable metal belt clip and the versatile design that allows you to adjust the carry height and angle so that it stays in place while it’s barely there. Crossbred SuperTuck Holster. The super tuck holster stays true to its name, giving it superior tucking design for the ultimate comfort and concealment, even with a non-loose wear. You can do your personal carry style, with or without tucking in your shirt and the holster would look and fit just great. It is a much lighter item with its 6.6 oz weight and the fully adjustable cant and ride height. Crossbred SuperTuck Holster. 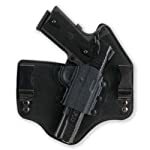 The modular clips and high quality hardware of this patented Crossbreed holster are features that make the item conform to your desired position. It has fully mountable and molded Kydex pocket and the innovative SuperTuck technology for the ultimate concealment. Galco KT224B Holster. The lined saddle leather holster highlights the adjustable backing plate with the rigid Kydex designed pocket for easy holstering and draw. It is also adjustable, thanks to its KingTuks removable belt clips made of premium quality metals that move up or down, allowing you to set your desired carry height and angle. Alien Gear Cloak Tuck Holster. The thoughtful and practical design of this holster enhanced its flexibility and adjustable features including the housing construction that allows gun swapping while keeping a single holster base. Based on the criteria and product performance, which is the best IWB holster for Glock 17? Do you have changing needs for a conceal carry holster? Do you want total concealment for years? Do you need a more affordable holster? Find the best IWB holster for Glock 17 with the help of our comprehensive review and a look at our top 3 bets for your conceal carry holster update or new purchase. Other must-haves include the paddle holster for different weapon versions.